If you like martinis, you will need to try this variation: the Astoria Bianco cocktail, created by Jim Meehan, the guy behind PDT, the famous New York speakeasy, and the The PDT Cocktail Book: The Complete Bartender's Guide from the Celebrated Speakeasy . The recipe is quick and easy to make, and it tastes fabulous. Just make sure you drink it fast enough so that it doesn't get warm. 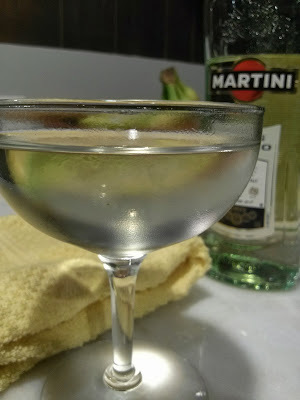 Like most martinis, the published PDT recipe can be halved to make sure you have it cold the whole time you drink it. Warm martinis are no good. and then garnish with an orange twist after straining into a chilled coupe. Part of the reason I like this recipe is that the Astoria Bianco is surprisingly refreshing and clear. For a drink made with all spirits, that's saying something. Maybe a little bit of yellowing from the orange and bitters, but still a nice martini color. A bit sweeter than a regular martini, more like a perfect martini. So if your guests love martinis but want something different, try this one. But if they don't like martinis, the Astoria Bianco cocktail is not for them. Don't waste your liquor.